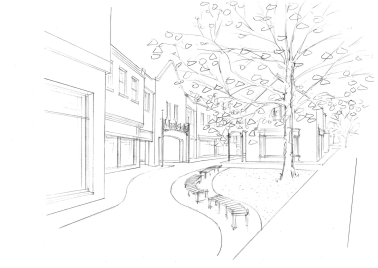 A high footfall area in the centre of Witney is to be repaved making it safer and more attractive for residents and visitors. The area is at the lower end of the Market Square, near the Woolgate entrance by Bakers Butchers. Starting on 5 April, it is expected to last around 3 weeks. During this time there will be access for shoppers and traders. As well as re-paving the renovation will include new street furniture and additional seating. Oxfordshire County Council repaved the central Market Square area in 2013 and Witney Town Council completed its Corn Exchange renovation project in June 2015. The cost of the repaving work and new street furniture is £30,000. The scheme is paid for by developers of new housing estates in Witney.